The day was absolutely beautiful. After a summer of rain, it was a pleasure to receive this unexpected invitation, if for nothing else than to get away from the never ending growing weeds that face me every day on the farm. Luckily my friend Yvonne Cunnington was also invited. 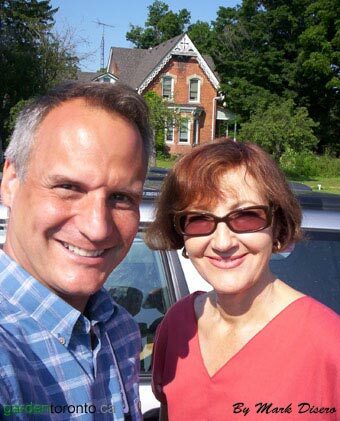 We planned to make this a mini road trip, my Thelma to her Louise. Yvonne took the opportunity to show me her new GPS, but we soon had to shut it off because it kept on interrupting our conversation. The Stokes Trial Grounds were easy to find, in St. Catharines, just off the QEW. I brought along my first Stokes catalogue, 1979. I was 13 when I first ordered from Stokes. I can't remember all that I ordered but I do remember a Coleus mixture. It amazed me that every seedling had different shapes and colour combinations. 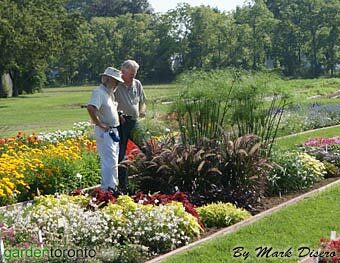 The Annuals trial beds looked fantastic. Here Ken Brown is being shown the latest Papyrus 'King Tut' by Stokes CEO, John Gale. 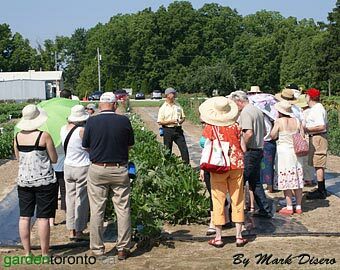 There were tons of bedding annuals to see, but we were there to taste the Tomato varieties. Wayne Gale, President of Stokes, and Laurie Scullin, President of The New Product Group, briefly describe how we were going to proceed. We were given pads and pens to make notes on all the varieties we would try. 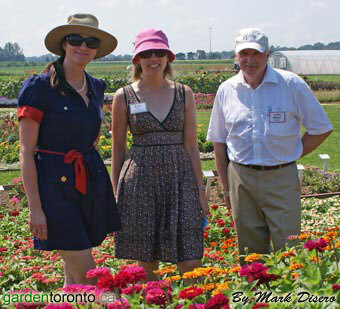 Yvonne was ready, and so was I.
Canadian Gardening Magazine was present with Editor-In-Chief Erin McLauglin and Web Designer and Blogger Tara Nolan, in pink. 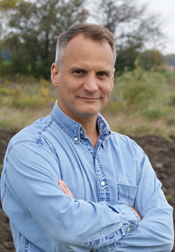 Jim Inksetter describes the qualities and history of the varieties under trial. 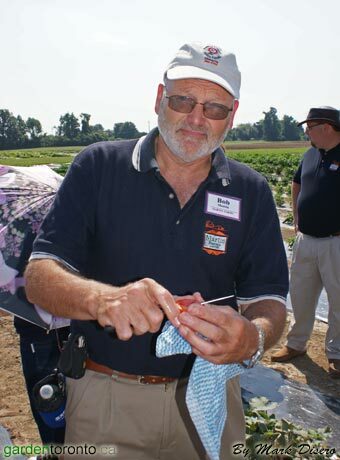 Bob Martin helps to slice up the tomatoes so that everyone has a chance to try them. 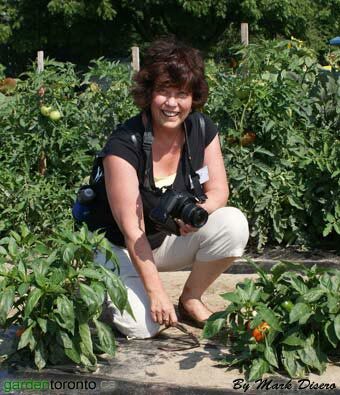 Pat Crocker was busy photographing all sorts of vegetables including peppers, eggplants and cucumbers. 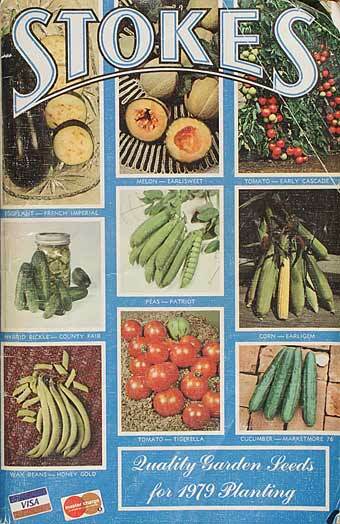 Of the tomatoes, I personally liked the low acid sweet varieties. I can't tell you which were the best because everybody has their own palate. All I can say for sure is that years of work and evaluation go into every variety and only the best make it to the store shelves. 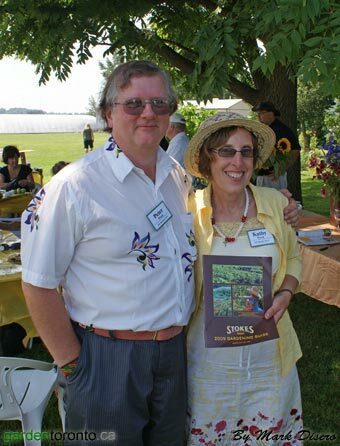 I think President's Choice has the right idea by choosing a local company like Stokes to provide the best quality seeds to local producers like Martin Farms. 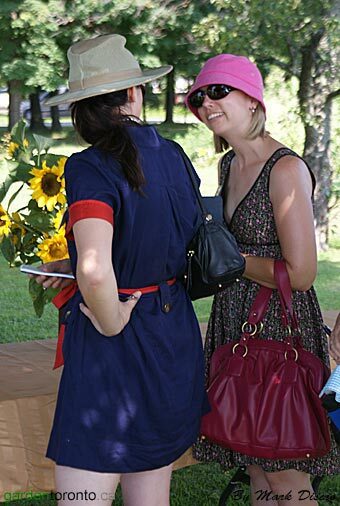 Here Erin McLaughlin, Tara Nolan, and Peter Cantley, VP of Lawn and Garden for President's Choice, admire the Zinnias. After the tasting we sat down to a light lunch. 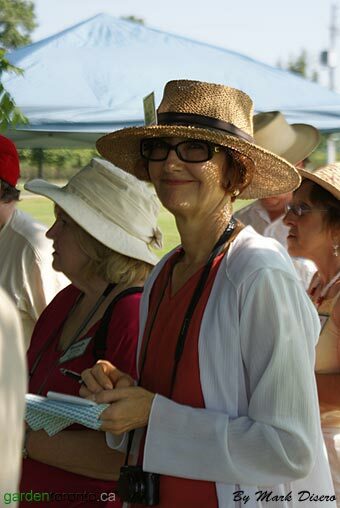 It was nice to connect with many of the garden writers that I have communicated with but never met in person. 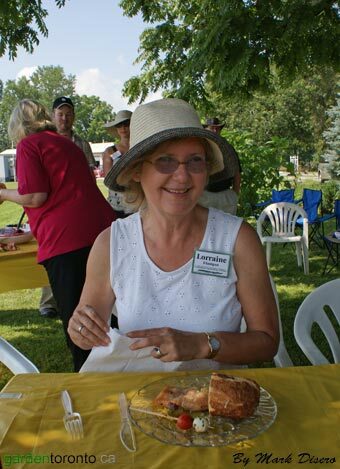 Lorraine Flanigan gets ready for her lunch. Here Peter and Kathy Wood show me their new Stokes Catalogue. 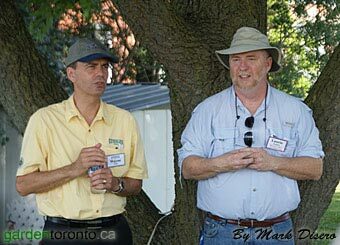 We were fortunate to be invited after to take photos of the gardens at Martin Farms by Bob and his wife. Their home was gorgeous, situated right on the lakefront. 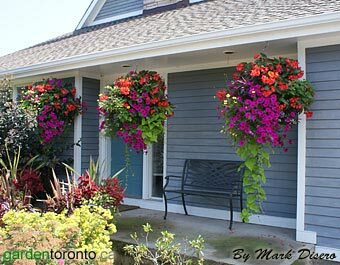 The gardens were very nice but the hanging baskets on the front porch were really spectacular even in the heat of midday. 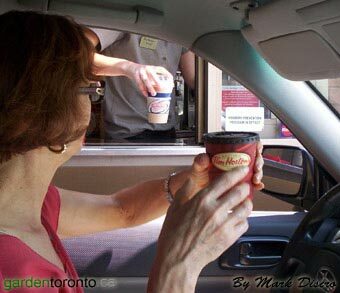 After all this excitement the only thing left for us to do was to grab a quick coffee and head home. 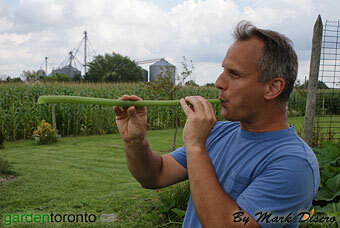 Years ago, when I was a kid, my father showed me how to make a horn out of a zucchini leaf. 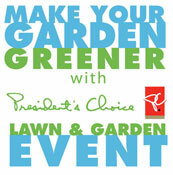 I was goofing around at last week's President's Choice Event and made one to the amazement of the people around me. Some of you have asked me to describe how I did it, so here it is. Remember, this is NOT a trick that children should be doing. It involves a knife. Only adults should attempt this, and even so, they should be very careful. 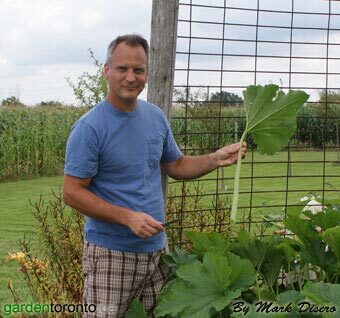 First you need to cut a fresh zucchini or pumpkin leaf. 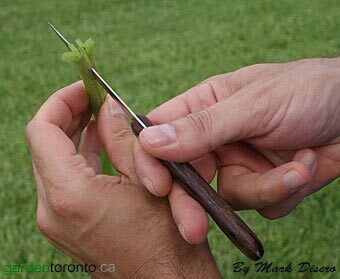 Then you carefully cut off the leafy end. 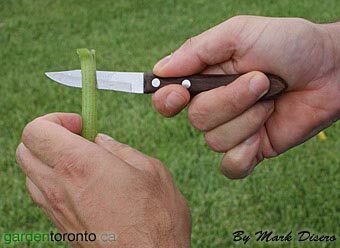 Do not cut it so that the stalk looks like a hollow straw. 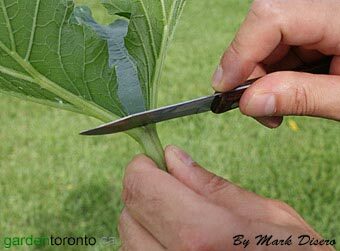 The tri-lobed base of the leaf should remain on the stock. Then carefully cut down the centre of the stock. The cut should go about an inch and a half down. This top part now becomes the reed of the horn. It is the vibrating of the two sides that makes the sound. When you blow the horn do not squeeze the reed between the lips like you would a saxophone or a clarinet. Place the reed above, but not touching, the tongue. Blow softly. It may take a few attempts. The sound is unique but has been compared to a trombone. Now go out, and amaze your friends!